In Smart Shipping Bar, there are several different ways you can display your bars. Want to show a discount only for people shopping in a certain collection? No problem! Feel like offering free shipping for domestic orders only? Can do! Don't want to show the bars on your contact page or blog? Definitely possible! We've got you covered for all these options, and the instructions are below. Feel free to jump ahead to the section you need by using the links below. Want to show your Smart Shipping Bar to visitors in certain countries? You can totally do that! You have the option to either show it to everyone in all countries, or select certain countries with the drop-down selector. 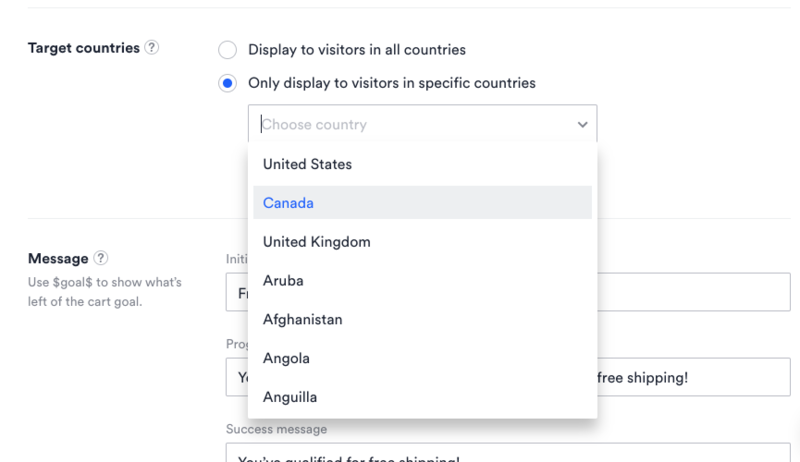 All you need to do is select the second option — Only display to visitors in specific countries — and enter the countries you want bar to appear for. This field features fancy predictive searching, so if you're unsure of spelling, just enter the first letter and scroll through the options. After you've added a country or two (or more!) you'll see them populated on the page. If you wish to remove one at any point, simply hit the grey "x" beside the country! It's pretty common for merchants to want to show their bars on particular pages and that's exactly what this option allows! You can choose to show your bars on all pages, only on the homepage, or by targeting specific pages. To target pages individually, paste their URLs into the Only appear on specific pages in my store field. After entering your input, hit Enter on the keyboard (or click the Add button that appears) and you'll see it appear in a list below. Use the x's adjacent to each URL if you need to remove a targeted page. If you want to select your homepage only, you have to enter two forward slashes: "//"
If you want to select your collections list page (that's the place where all your collections are listed, of course) then enter "/collections"
If you want to select a specific collection (let's say you want to advertise shipping only for one collection that sells barbecues) then enter "/collections/barbecues"
Remember that the minute you add any URL here, your bar will only show up there and nowhere else on your site. It's also pretty common for merchants to want to hide popups on certain pages. For instance, you may not want to show your bar on your homepage but you want it to appear on every other page in your store. No problem! This Exclude pages option has you covered and works exactly like the Target pages option. Just specify the pages where you don't want your bar to show (use the examples above for reference) and, like magic, it won't show there! Maybe you want to show free shipping or discounts for your users shopping on a desktop, and make mobile shoppers pay full price! Or maybe the other way around. With Smart Shipping Bar, you can specify by device - mobile or desktop. Just choose the option you want to go with, and you're all set!